First, let me tell you about Bailey. When I got Bailey I was working at a training/breeding field Lab kennel. He quickly learned from the other dogs that the orange retrieving bumpers (used to train bird dogs) were extremely cool. Bailey became positively crazy for the things. When we lived across the street from a park, we went over and played fetch with them nearly every day. When we went over to my parents' house, my dad would throw bumpers as far as his arm could fling them and Bailey would run after them at break-neck speed. The running wasn't so much the problem - it was the stopping that worried me. I loved that Bailey was having such a great time, but I was always afraid he would rupture a knee ligament. I find we are exceptionally lucky all he ever really ended up with was a limp that lasted a day or two here and there. Unfortunately, in my opinion, he did suffer joint damage as a result of this kind of play. I have seen a fair amount of research about Unilateral Hip Dysplasia. All this means is that only one hip is displaced from the socket while the other is normal. There are many opinions on the topic, but one of them is that unilateral hip dysplasia doesn't just "happen" - it is made - usually by injury. The idea is that if hip dysplasia is genetic, both hips will be affected, but if only one hip is displaced, it likely is the result of an outside cause. Now, I don't agree that this is always the case, but I do think it's something to consider. Some studies have been done showing that better hip health is achieved in puppies who are exercised freely (under their own power and motivation) for greater portions of the day as opposed to puppies who are crated and then encouraged to burn off their excess energy quickly via things such as "dodge and dart" games. The pounding caused by games like "fetch" and the stress on joints from sudden stopping can have a lasting affect on joint health. I find that to be a pretty substantial cause for concern. I also think it makes perfect sense. I can't tell you how much of it is a result of our games of fetch, but I can tell you that Bailey suffered from a lot of joint pain. I certainly have to wonder if the times he was so out-of-his-mind-excited to get the bumper that he launched himself of my parents deck from the top step, or even just the regular games of fetch, didn't have something to do with the way he hobbled around as an older dog. It's a terrible feeling - wondering if something you did lead to your dog's pain - even if you had no idea you were doing anything wrong at the time. As Bailey got older, and I got more afraid he would hurt his knees, we began playing our game a little differently. I took him out in my parents' back yard and handed him the bumper instead of throwing it, and played chase with him at a more moderate speed. He would run "victory laps" around the yard while I pretended to stalk him. (he had a pretty good recall and would come if I asked him to so this wasn't really the bad form of "keep away" where I wasn't in control and he thought he was getting away with something) Another thing we did is play fetch in the water - I would stand at the edge of the water and toss it back in for him to fetch. 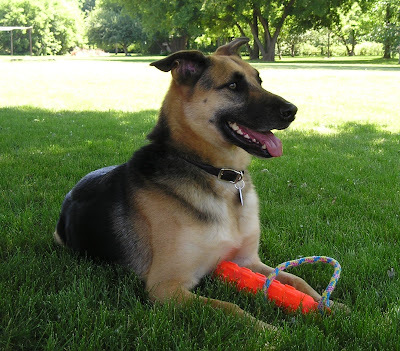 If anything, water retrieving is some of the best exercise you can give your dog, you just have to be very attentive to his limitations if you have a dog who will keep trying to go after the ball even if he is totally exhausted. (Truly, the game shouldn't be played without a life jacket) These alternate forms of the game were significantly better for his hips and seemed to be just as fun for him. I can't help but wonder what might have been if I had always played this way. I don't wallow in guilt about it - what's done is done - but I absolutely have changed the way I handle my dogs as a result of my experiences with him and with the information I have gathered. Mendel enjoys Bailey's bumpers, only more for the rope than for the fetching. Lilly does enjoy tennis balls, but she doesn't care to use them when she engages in play with me - she doesn't get anything out of it. (the only time I will ever even touch one at the dog park is to kick it across the ground to show her I found one she can play with) You see, Little Miss has figured out that OTHER dogs like them - which is a very good way to get them to chase her. Occasionally, she gets so wrapped up in the excitement of a chase that she actually drops the tennis ball from her mouth and gets frustrated because the dog stopped chasing her and went for the ball instead. Lilly never got into the habit of playing dodge and dart games with me, so she doesn't even see me as a source for that type of play. This sort of relates to the reason I am on the fence about having Lilly do agility, as well. Her front end is structurally very straight and that means that every time she jumps those front joints take a beating (a well angulated front can cushion the blow and take stress off the joints). If I were to do these things with her I'd need to either remove the bars for the jumps or put them on "chihuahua height" so she doesn't pound her front and hurt herself. I likely will never compete with her because the pounding she would take during practice simply wouldn't justify it. Read more about structure and why it's important here. 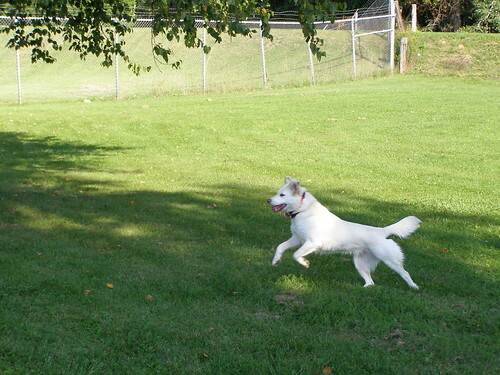 Lilly loves to instigate a good game of chase. I love that she engages in self paced play. There is a fine line between allowing our dogs to be dogs (which I think is exceptionally important), making sure they have fun in play, and keeping them safe and healthy. It's a line that, unfortunately, I don't think can always be effectively walked. Sometimes we just have to do the best we can and spend equal amounts of time on each side. A reasonable argument for the purchase of healthy, well bred, purebred dogs can certainly be made. I won't have to be nearly as careful about what I do with Mendel as I have to be with Lilly (or probably should have with Bailey). Mendel is put together correctly, his body is built for work and athleticism, and he will have the proper nature-given growth hormones he should have throughout his entire life. (This certainly doesn't mean I don't have to be smart about things such as not allowing him to jump off beds and couches while his joints are still just developing as a young dog) I love my rescue dogs with all my heart, it's just something to think about when we make these decisions. I will absolutely never spay or neuter a dog before 2 years of age ever again. More likely, I will never spay or neuter one of my dogs at all if I don't have to in the future. Just as injury can lead to potential joint damage, so can removal of important growth hormones. An astounding number of studies are coming to light completely refuting much of what we thought we knew about neutering our dogs. When important growth hormones are removed at a young age, strange things start to happen - bones grow longer (because those missing hormones were responsible for closing growth plates at the appropriate times), parts of the body never fully develop, and the risk of some cancers are actually increased (instead of decreased as we once thought). When bones grow longer, proportions change and risk of torn knee ligaments and joint damage can be increased (among other things). This is something to keep in mind especially for canine athletes - it is important that their bodies fully develop as nature intended in order for them to perform at a high level without injuring themselves. Often people think that since they are only going to do agility with their dogs, they don't need one of those "fancy show dogs". The fact is, those fancy show dogs are quite often bred specifically for correct proportions (this is certainly not always the case, you MUST do your research) and that means the well bred ones are going to be your best bet for a performance sports - as long as you commit to allowing them to develop as their breeder intended - this means not neutering too early, if at all. There is no place where correct proportions, joint angulation, or knowledge of canine physiology is more important than a canine athlete. Many of the show breeders I work with have a requirement written right into their contracts that the dog is not to be spayed or neutered until 2 years of age. I encourage you to find out more (and check out some of the studies on the health effects of spay/neuter) here and here. A great comprehensive look at the effects of neutering, and a great look at the alternative, expected to be available again in the US. Please Please Please watch this video. I PROMISE YOU, you will be glad you did. Information on hypogonadal teenagers, such as those with Kallmann's syndrome, who have little or no testosterone or oestrogen present in their bodies (as a spayed/neutered dog would) and bone calcification does not occur during puberty. 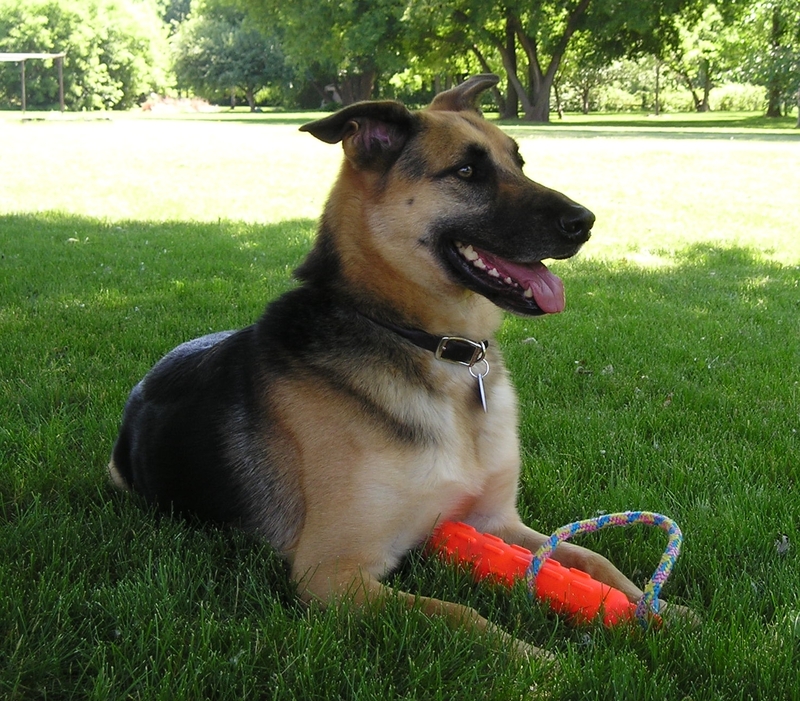 Think about it - you will see more damage to the bone and arthritis in a dog with less dense bones. Certainly, pet owners need to decide for themselves whether they are truly capable of handling an intact dog. There is no doubt many are not. I do find it very interesting how different the "norm" is in the US vs Europe (I really don't know for sure what the climate is like as far as neutering in Canada). If you asked people who have lost a dog to bone cancer, would they say they might have chosen not to neuter their dog if they had been given all the facts? I don't know. I do think that most people would say they at least wish they had been given ALL the facts... told the truth, rather than been given a one sided bit of propaganda. I am not against neutering. I think it's necessary in the case of shelter pets (with a few exceptions) upon sale to new owners. I do, however, have a very big problem with the effort to push mandatory spay/neuter laws, and I also generally have a problem with spay/neuter campaigns because they do not offer up ALL the facts. If you're trying to educate people, you owe them the whole truth - not just what you want them to hear. I think it is also very important to recognize that often times many of the problems associated with spay/neuter can be prevented simply by waiting until a dog is sexually mature to do it. Surely it's not to difficult to keep a dog you've committed approximately 10 years of your life to from running off and procreating to his/her heart's content for the first 2 years... is it? I'm not writing this to make anybody feel guilty or to suggest that my way is the right way. It's simply the conclusions I have come to as far as the care of my dogs and hopefully an encouragement for people to do their own research that will inform their own decisions.